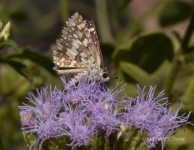 This site is dedicated to Deen Day Smith Sanders in appreciation of her extensive work and long-term committment to butterfly conservation and butterfly education. Deen has among other things, donated the Cecil B. Day Butterfly Center at Callaway Gardens, Pine Mt. GA; spearheaded the construction of and completion of the National Garden Clubs, Inc. Butterfly Garden at the US Botanic Garden; supported the National Garden Club's butterfly awareness program for many years, and has supported butterfly educational programs, publications, and study tours for garden club members and for the public..
Encouraged by my grandfather Childs Frick, a noted Paleontologist, I began my arthropod collecting early. He provided me with a net, boxes and bottles pins and tools, a microscope, and as many books on related topics as my shelves could hold. I loved our discussions which were soon followed by letters feeding my curiosity and leading me towards new findings. Life has taken me in many directions, yet those fundamental explorations of nature with him, set me on my way to being a naturalist. Help along the way... Thank you! Special thanks to Michelle Mensigner, The New England Wildflower Society, Jackie Stone, Mary Arekalian, Ron Birrell, Shirley Sekarajasingham , the Dallas County Lepidopterists' Society and Jeffrey S. Pippen, www.jeffpippen.com for use of their images, and /or the ability to hyperlink to their photos on their web sites, Above all, thank you to the National Garden Clubs for giving me the opportunity to work on Butterfly Conservation issues with them as well as having the pleasure of assisting on several of their publications. 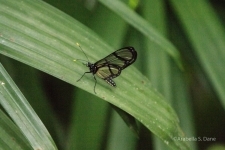 To Jeff Glassberg, President of NABA (North American Butterfly Association), and Linda Cooper, NABA, and Martin Feather, Fairchild Gardens, special thank yous for your help in identifying my own butterfly images and for your patience with my endless questions. 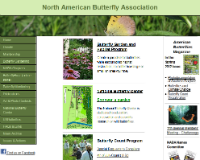 Research on habitat, host plants, ranges and status was compiled mostly from data within the BAMONA ( Butterflies and Moths of North America) web site,and from Butterflies of America in addition to other links on the web, and various books and publications. 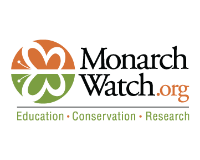 These resources include among other sources, web information and data from publications by the Xerces Society, the National Wildlife Federation, the US Fish and Wildlife Department, and others. 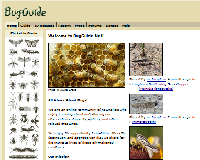 The pollinator information on this site is nacient and incomplete. For the data within, photo id has been augmented by the wonderful folks at Bugguide.net. General information comes from many sources on line and in print. And the fine work by Katie Heineman at Center for Plant Conservation has greatly enriched the records on the endangered plants of North America in their participating instututional collections. Information on the plants that sustain the caterpillars in the Lower Rio Grande Area of TX by several National Butterfly Association members has been incorporated and the extaordinarily detailed work tbyMike Quinn, Invertebrate Biologist, Texas Parks & Wildlife, Address: 3000 IH-35 South, Suite 100, Austin, Texas 78704 did for NABA is so noted. 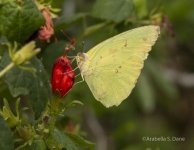 I wish to thank Robert A, Behrstock of http://www.naturewideimages.com/ fame for his generosity in sharing his wonderful plant and insect images.
. I appologize for any and all mistakes and omissions. They are unintentional. This is a work in progress. 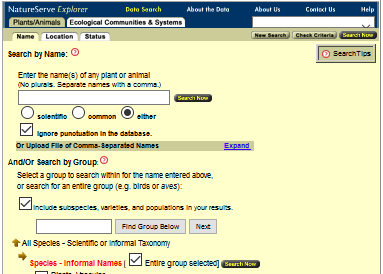 Search for data and images of over 100,000 plants. Find the botanical name, common names, host status and more.